But WeCare consistently receives high satisfaction scores from employers. Why? Because WeCare is customized, flexible, and reliable. It solves your specific problems, meets your particular service requirements, and helps achieve your individual performance goals. Here’s an example…. Custom Solution. The City’s HRIS was too expensive and too inflexible to support its growing enrollment needs. We developed a customized WeCare online benefit enrollment front-end as an overlay to the City’s enterprise system. Progress Tracking. We also created a system within WeCare® which tracked participation in the City’s wellness and tobacco cessation programs, and exported current, real-time progress data to its HRIS. Plan Participation. 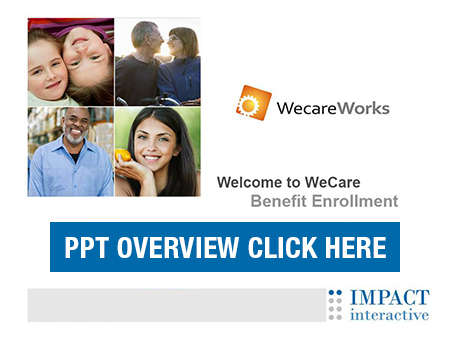 WeCare’s personalized calculations, simple explanations, and step-by-step operation significantly increased participation in the City’s core and voluntary benefit plans. Our WeCare team members are highly-trained, software development experts. They understand the enrollment technology challenges you face. They are totally committed to creating frustration-free systems — and delivering them with high-impact service. Impact Interactive© All rights reserved.